Warmer temperatures and sunny days have finally arrived and so have the first flowers of spring! This might entice you to do a bit of gardening. Understandably, most gardeners are anxious to plunge their hands into the dirt and get growing. 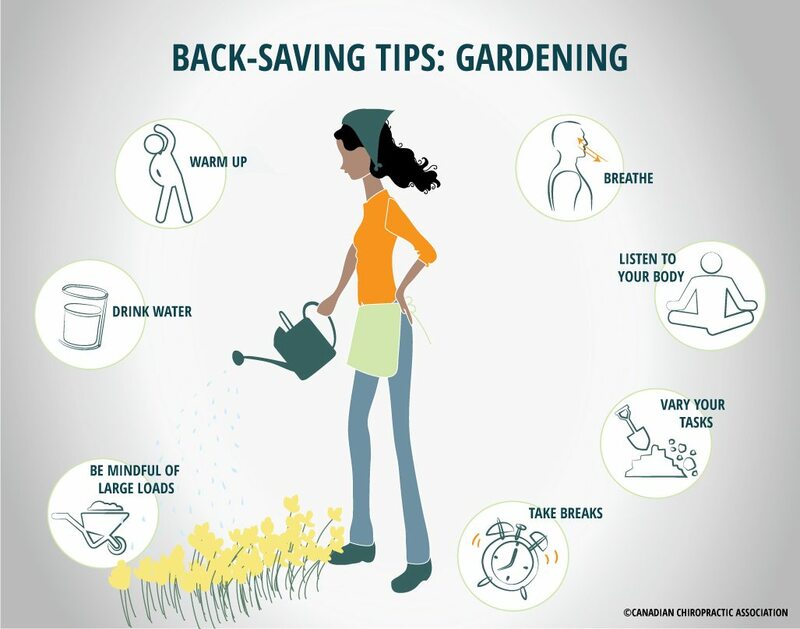 Gardening can be an extremely rewarding pastime, but it can also come with an increased risk of aches and pains if you’re not careful. 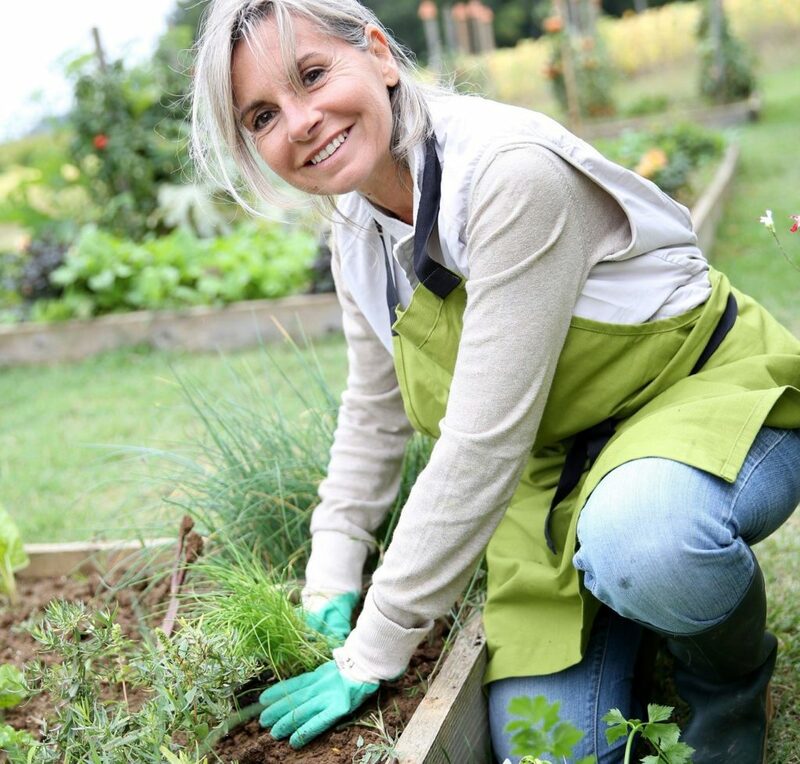 We’ve put together a few tips to help you maximize your joy of gardening while minimizing the risk of pain. After waiting all winter, it may be tempting to jump right into the spring garden cleanup. Do your future self a favour and pause to warm up your muscles before you start the work. Like any other physical activity, gardening requires preparing your body for the new movements. In fact, over the winter months, you may have become deconditioned and will require some time before you can invest yourself into a regular gardening routine. Straighten Up Canada only takes 3 minutes and helps to improve your posture and keeps you moving. When you’re in the zone, one can lose track of time. Hungry to see results, you might just plow through the work without paying attention to your body’s cues. However, it’s wise to pace yourself instead of powering through to get the job done. Set a timer and take a break every 15-20 minutes to stand up, stretch and walk around a bit rather than staying in the same position for extended periods of time. Hydration is always important, but especially when you are physically active under the sun. Carry a bottle of water along with your garden tools. When you take your break every 15-20 minutes, have a drink of water, too. While you’re stretching and hydrating, take in some deep, oxygenating breaths to nourish your hard-working muscles and help to improve circulation. Keep your shoulders and chest relaxed. When breathing deeply, you should see your abdomen extend out and then in calmly. It’s easy to get caught up in the sheer joy of getting your hands dirty. Gardening can be very meditative, in fact. However, be careful not to get so lost in the task that you ignore those niggling aches and pains until it’s too late. Pay attention to the messages your body is sending you. If you feel a twinge, take a break or change positions. Bags of mulch and soil or heavy potted plants come with the territory. Instead of lugging a whole bag of soil from one end of the garden to the other, consider using a wheeled cart. Divide large loads into smaller batches that are easier to handle. If you must lift something heavy, consider asking for help, or check out these pointers on how to lift properly without injuring your back. Rather than concentrating on one area or job at a time, vary your tasks to ensure that you aren’t holding the same position for extended periods. Gardening can be a lot of work, but it’s also a great source of pleasure and beauty, all the more so when you feel in top physical condition! We’ll have more tips next week, but in the meantime, take a look at the Resources section of our website to learn more about how to Plant and Rake Without the Ache and other useful tips to stay healthy doing the activities you love. This blog was written, and shared with permission, by Canadian Chiropractic Association.